Very little of Rotterdam survived World War II. While this means it is not the place to see the Netherlands you expect – charming streets along canals, 16th century merchants’ homes, or picturesque windmills – it is the place to see post-war architecture. 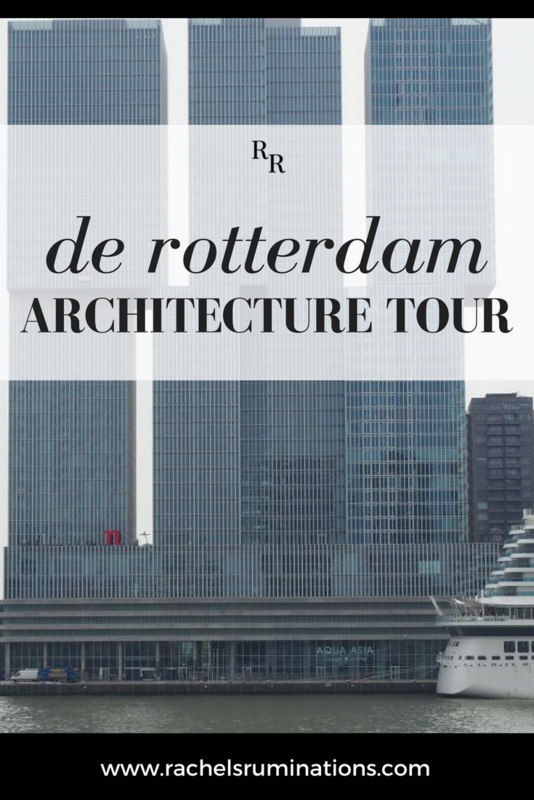 This is why I signed up for a tour with De Rotterdam Architecture Tours. From “modern” architecture that isn’t so modern anymore, to post-modern, cutting-edge, new developments, Rotterdam is known for its innovative approaches to architecture and city planning. For a layperson like me, this means there are just a lot of really interesting buildings everywhere you go. 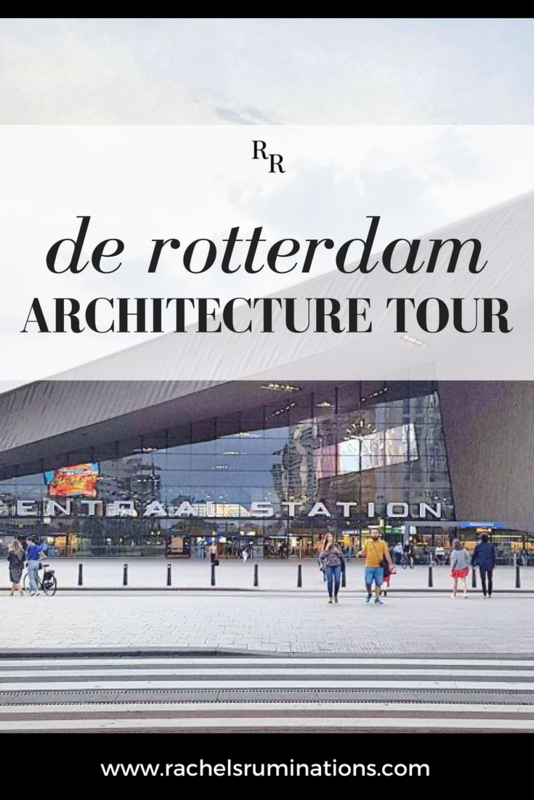 The tour I took, what De Rotterdam Architecture Tours calls the “Turbo Tour”, focuses on just a few very recent buildings. We started in the lobby of the De Rotterdam building. 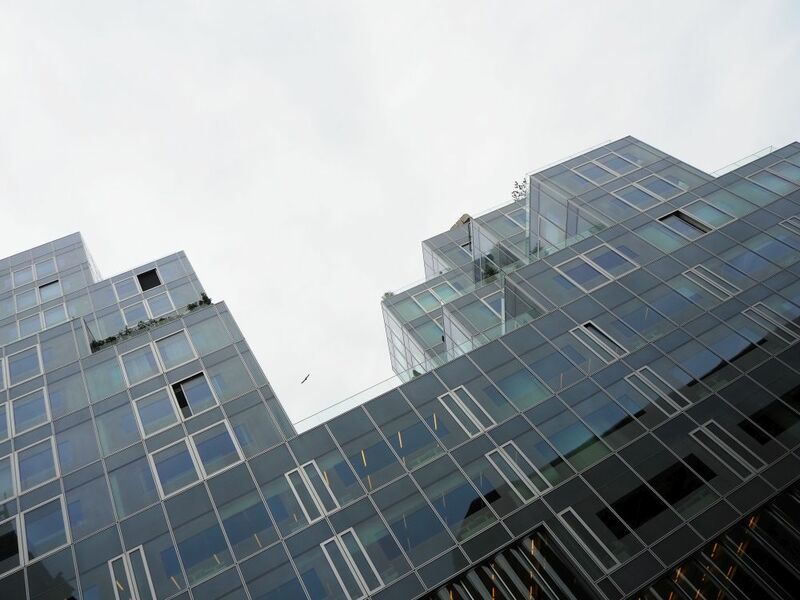 Designed by Rem Koolhaas of the Office for Metropolitan Architecture (OMA), it was finished in 2013. The De Rotterdam, as seen from across the Maas River. Notice the window cleaners on the left-hand tower. De Rotterdam sits in a prime spot, right on the “other” side of the famous Erasmus Bridge that has become a symbol of Rotterdam. 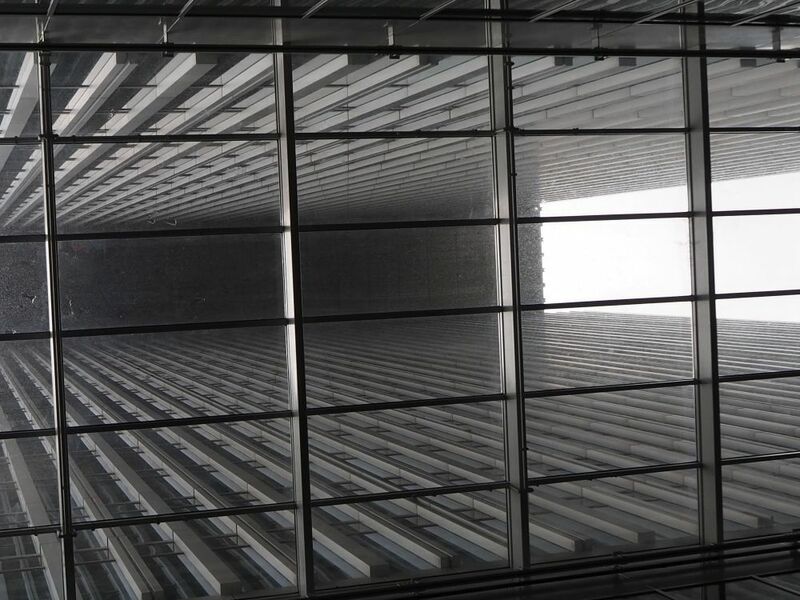 Its design, in which the three 38-story towers, connected below, step away from each other in the upper half of the building, is extremely striking. I snapped lots of pictures of it before I even knew it was included in our tour. The Wilhelmina Pier (Wilhelminapier) where De Rotterdam stands isn’t really a pier. It’s a spit of land that sticks out into the Maas River that divides Rotterdam. Once primarily industrial and shipping, Wilhemina Pier is being redeveloped into a working and living area. The older industrial buildings have either been repurposed for office space or replaced by more modern creations like De Rotterdam. 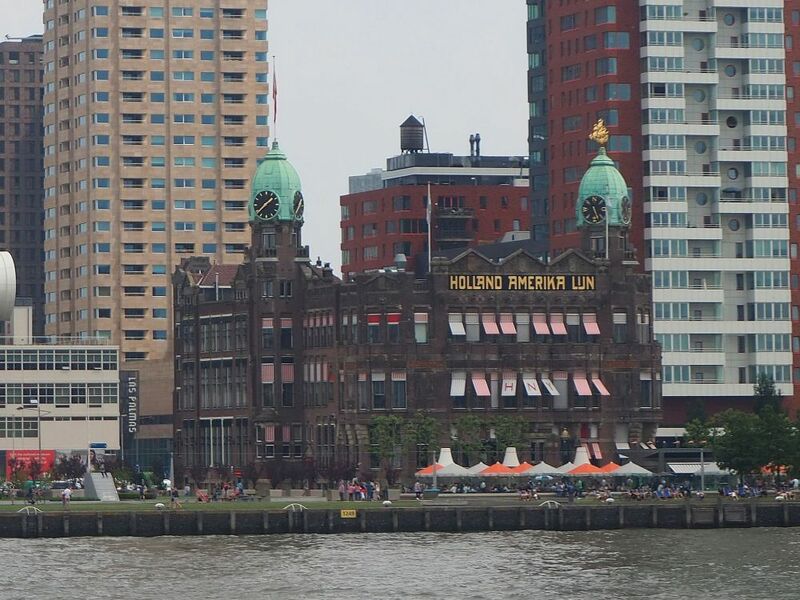 At the tip of the Wilhelmina Pier you can still see the original Holland-America Line building, where so many people from all over Europe boarded ships for America. It’s now a hotel and restaurant. The old Holland-America Line building, right on the tip of the Wilhelmina pier, is surrounded by taller, more modern structures, but still retains its charm. 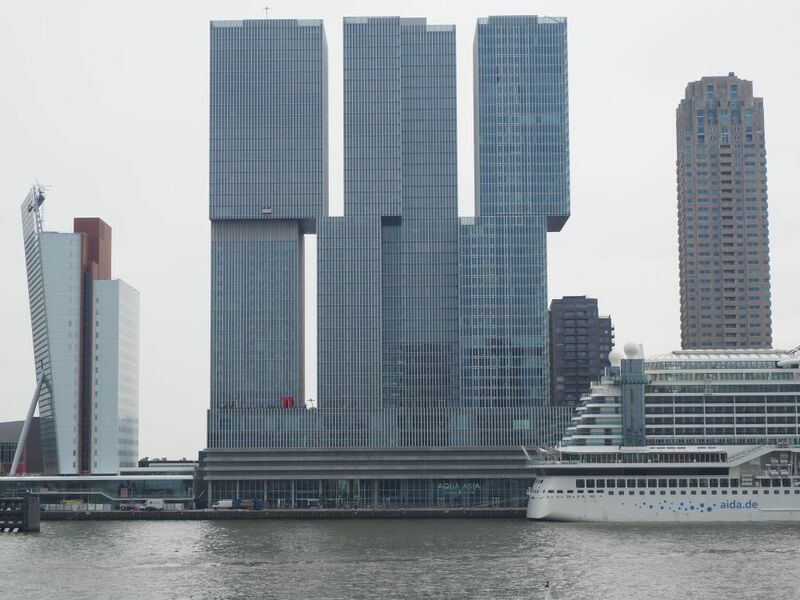 De Rotterdam, our tour guide explained, has three uses: office space, a hotel, and apartments. It is the biggest building in the Netherlands at 162,000 square meters. Some of the office space has been rented out to the Rotterdam city government, the city’s way of subsidizing the costs of building it. Looking out and up from inside one of the lower floors of De Rotterdam. As part of the tour, we were able to enter the building and see it from the inside out, from the 31st story. The entire floor hasn’t been rented out yet, and consists of a large, empty space, punctuated by support beams. The only internal walls enclose the central elevator shafts and, presumably, the toilet block and plumbing. Surrounded by vertical floor-to-ceiling windows, we had a wonderful almost-360-degree view of the city. Out of curiosity, I looked online later and found an ad for a 145-square-meter three-bedroom apartment on the 23rd floor. It has a large open-plan living room / dining room / kitchen with windows on two sides. All three bedrooms and the living room have access to a 22-square-meter balcony. The price? €975,000, plus €354 per month for the building fee. 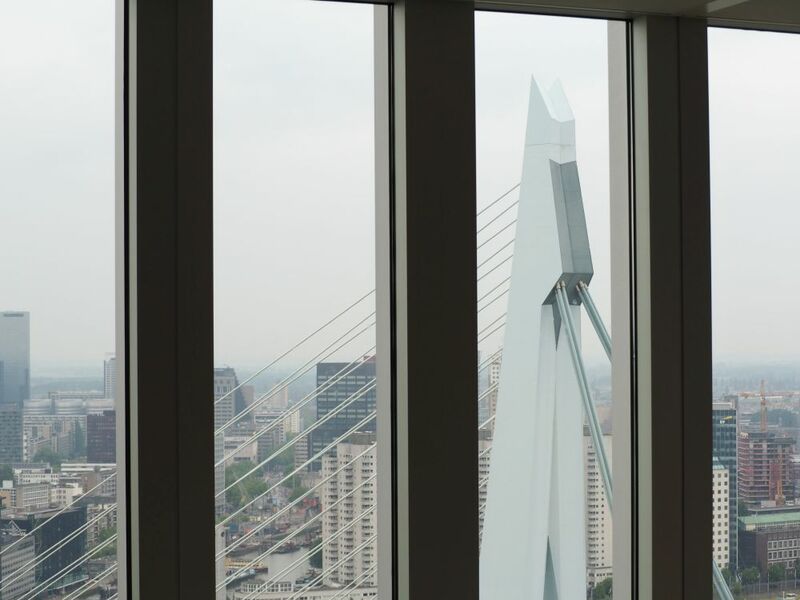 The Erasmus Bridge as seen from the 31st floor as part of the De Rotterdam Tour. Our tour guide told us that part of the point, for Rem Koolhaas, was the idea of creating a vertical city, where people are not closed off from each other. That means lots of glass. In the spaces where the towers are not connected, they are very close to each other, so that people in one tower can see into the next. The metro took us right to our next stop, Rotterdam Central train station. The first central train station, built in 1957, was torn down to make way for this one, finished and opened in 2014. Designed by a team of agencies called Team CS (made up of Benthem Crowel Architects, MVSA Meyer and Van Schooten Architects), the station had to be bigger and better to accommodate increased passenger numbers and international train lines. 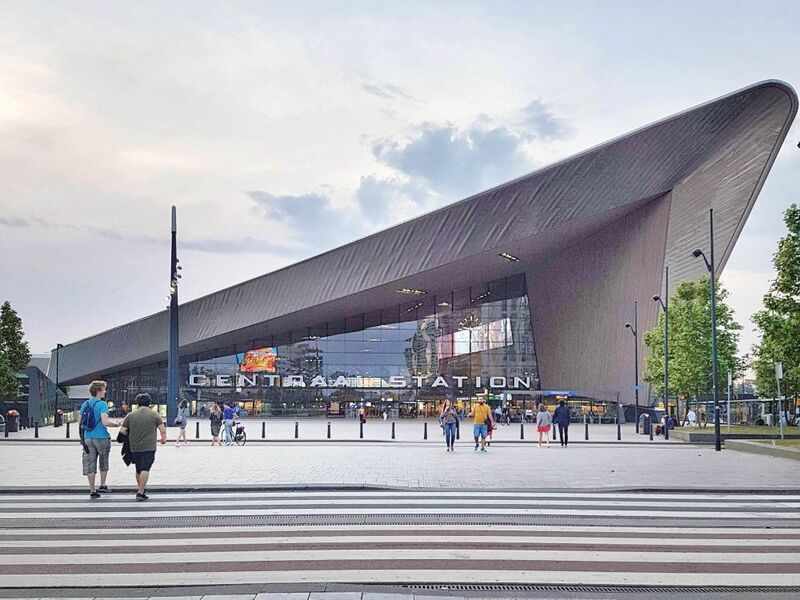 The new Rotterdam Central train station. Photo by Jessica Cutrufello of A Wanderlust for Life. It’s certainly a striking design and, according to our tour guide, it led to a complete transformation of the area surrounding it. He said it used to be a dangerous place that most people avoided like the plague. What we saw was very different: a bustling station and commercial area surrounding it. From the Central Station our tour guide led us on a short walk. We passed the Stadhuis (City Hall), which survived the war, though we could spot plenty of damage on its walls from shrapnel. We also stopped at Saint Laurens Church, which has the sad honor of being the only medieval architecture left in Rotterdam. It makes a rather forlorn sight today, surrounded as it is with some rather ugly buildings from the 1950s and 1960s. Our third stop was at Timmerhuis, another living and working combination, with offices below and apartments above. Like De Rotterdam, glass predominates, and, like De Rotterdam, the idea of people seeing each other and making up a community is visible in the design. This isn’t surprising, given that it was also designed by Rem Koolhaas and OMA, and completed in 2015. Timmerhuis as seen from the street right in front of it. This time, though, rather than a vertical city, you could see this one as a horizontal equivalent. Made up of a series of cubes, piled up but offset from each other, it has a combination of uses: government offices, like at De Rotterdam, on the lower floors, and housing in the upper cubes. Entering the building, we found ourselves in what is essentially a plaza, but indoors, under glass. People passed by up above along glass-walled hallways. Again we were able to see the building from the inside out. We emerged from the elevator and stepped outside onto someone’s outdoor terrace: the top of one of the cubes, complete with jacuzzi. From there, besides admiring the view – less impressive this time – we could see the exact size of each cube that makes up the building, both in terms of the cubes rising around us and the cube we were standing on. 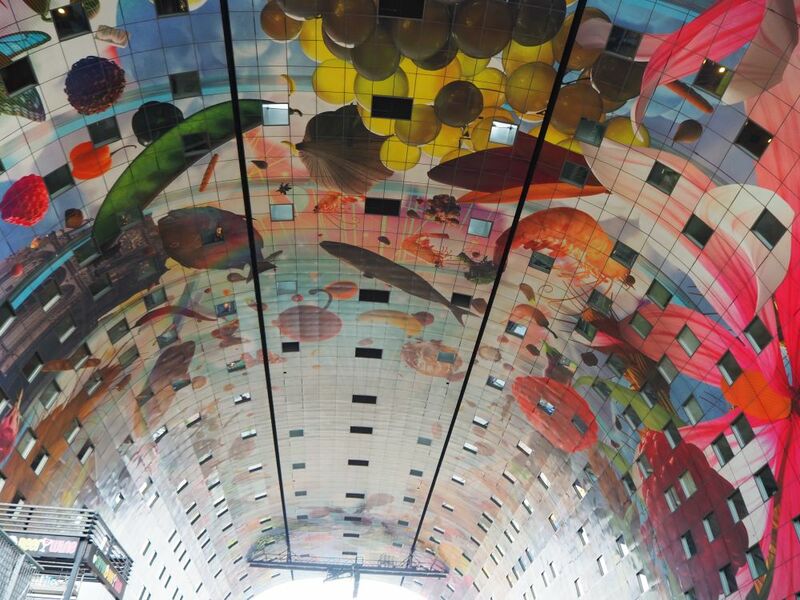 Our Rotterdam walking tour concluded at the Market Hall, a very new addition to Rotterdam, designed by MVRDV architects. Completed in 2014, it is an apartment and office building in the shape of an arch, sheltering a market underneath. The market is protected from the weather by the building and by the glass walls closing off either end. Seeing the Markthal from the inside made me wonder about the apartments: what do they look like inside, with those windows overhanging the market? Unfortunately, De Rotterdam Tours doesn’t have access to the inside in this case. Our tour did include a tasting: we could choose either stroopwafels (a kind of cookie with syrup) or cheese. I suggest the stroopwafels; they’re wonderfully sweet and gooey when they are freshly made. 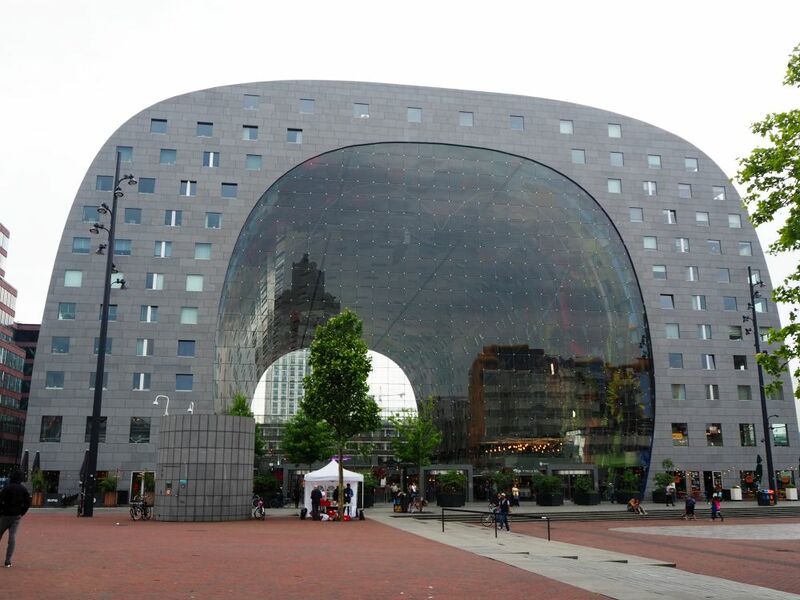 Our De Rotterdam architecture tour ended at the Markthal, but usually goes on to the famous Cube Houses right next door. (Bloggers stop to take a lot of pictures and ask a lot of questions. It always slows things down!) The Cube Houses are definitely worth a look. I wrote about them in my self-guided Rotterdam walking tour. Of course, these buildings are viewable without a tour, but on the inside you’re unlikely to get past the lobbies or other public spaces. If you’re into architecture and want to learn more about the thinking behind these designs, take the tour. Our guide (whose name I can’t remember for the life of me!) was extremely knowledgeable and patient. Alternatively, my self-guided Rotterdam walking tour lays out a route for you, incorporating these sights with more unique architecture and also some street art. If you’re interested in urban development, one tour looks in detail at the Katendrecht neighborhood, a quickly-changing, up-and-coming neighborhood not far from the Wilhelmina Pier. The Titan Tour includes De Rotterdam, a water taxi ride, and a short architectural walking tour including the Cube Houses and the Markthal. You can book it through this link. The Turbo Tour is the one I describe here, but includes the Cube Houses. They also occasionally offer a number of more detailed tours of just one building: De Rotterdam, the Markthal, or the Timmerhuis. The regular tours are mostly only on Fridays, Saturdays and Sundays. Prices range from €15.95-€24.95 and they take from an 1¼ to 2½ hours. Most start at 13:45, though a few start at 20:30. Wear layers and comfortable shoes and bring an umbrella or rainwear; this is the Netherlands and weather can change very quickly. If you enjoyed this article, please share it plentifully! 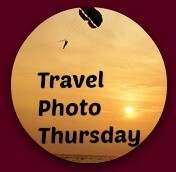 The images below are formatted for Pinterest.